We received the new book I Got Two Dogs by John Lithgow, my son loves me to read this book to him. The book comes with a CD that he really enjoys dancing around to. Fanny and Blue may not be the smartest dogs, and they may not be the best-behaved dogs, but they are definitely the most-loved dogs. John Lithgow's bouncy song - in the book and on the accompanying CD - is based on his own family's two dogs. 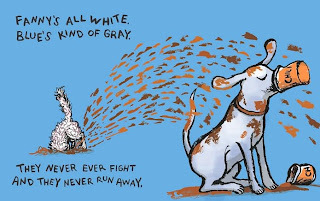 And Robert Neubecker's eye-popping illustrations capture the joy of all things dog. I really like the illustrations in this book which done by Robert Neubecker. I relly think besides a cute story the photos really help keep my 2 yr olds attention. I will soon be adding more books written by John Lithgow to my little ones book collection. We both really enjoy them. About the Author : John Lithgow is the New York Times bestselling author of Micawber, Marsupial Sue, The Remarkable Farkle McBride, and Carnival of the Animals. An award-winning actor, he has starred on stage, film, and television. He performs concerts across the country, and has recorded the CDs Farkle and Friends and Singin' in the Bathtub. 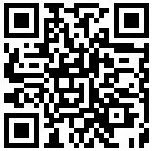 Visit John at lithgowpalooza.com. Tony, Emmy and Golden Globe-winning actor John Lithgow is coming to Turner Classic Movies (TCM) to host this summer’s edition of TCM ESSENTIALS JR. Lithgow, who has also earned acclaim as a children’s author, will present 13 films ideal for parents to introduce to their kids, beginning Sunday, June 7, with the musical classic Yankee Doodle Dandy (1942). TCM ESSENTIALS JR. will run each Sunday throughout the summer and will include such comedies as Father of the Bride (1950) and Mr. Hulot’s Holiday (1953), musicals like An American in Paris (1951) and It Happened at the World’s Fair (1963), and dramas like High Noon (1952) and Notorious (1946). TCM also produces a wide range of media about classic film, including books and DVDs, along with hosting a wealth of materials at its Web site, www.tcm.com. TCM is part of Turner Broadcasting System, Inc., a Time Warner company. 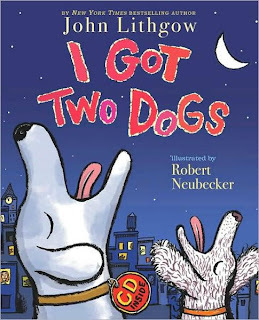 The book : I Got Two Dogs by John Lithgow !!! Email Has been sent to winners, you have 48 hours to reply. I missed Yankee Doodle Dandy already so I'd like to see You Can't Take It With You. I love Father of the Bride! I could watch it over and over! You Can't Take it With You sounds good. I've never seen that movie. I love Father of the Bride!! the 1950's version rocks! Oh! Yankee Doodle Dandy! I loved that one growing up! I love an american in paris. Thank you. I'd love to watch The Philadelphia Story. They are all great classics! I will choose Father of the Bride. I'd love to watch them all, but I'll make a special effort to watch The Philedelphia Story! I used to watch AMC alot. I like Father of the Bride. Father of the Bride would definitely be my choice. Thansk for the chance. I love them all! I have in fact, already watched a few but I'm looking forward to Gaslight. I'd watch Father of the Bride. I love Love LOVE the movie 'African Queen'! It's on TCM on 7/12/09, and you can bet I'll be watchin' ! I think this book sounds wonderful - my Grandson would love it! I follow your blog via Google, and LOVE it! They are all great movies. I'd especially like to see The African Queen. Thanks for the chance. I love Father of the Bride! I loved "The African Queen." I'd watch it again. Gaslight! That is a great movie. Thank you! I would like to watch The African Queen. To Have and HAve Not because I have never seen it. I've never seen The African Queen, and I'd like to. My husband does not allow The African Queen to appear on any channel unless we are watching it, so I guess that will be my choice! It would have to be Gaslight. We'd love to watch Father of the Bride again! I would love to watch The African Queen! Which is on July 12th! I'd love to watch Father of the Bride. I would like to watch 'It Happened at the World's Fair'. I will watch Yankee Doodle. I'll have to watch An American in Paris! Have always heard about it, but never seen it! I would love to see An American in Paris...and it's on tomorrow! Yay! BTW, I adore John Lithgow...and I love the video of him singing! It's great! Follow on Twitter (SeeryusMama) and tweeted! You are listed on my blogroll! I'd watch "it happened at the World's Fair"
I like Father of the Bride! I'd love to watch The African Queen! I would like to see You Can't Take it With You. I would like to watch African Queen - I have never seen it! I'd want to see Heaven Can Wait!! I remember seeing that movie YEARS ago and absolutely loving it! Plus Warren Beatty was soooooo cute! I've always liked An American in Paris! I like the Philadelphia Story. I saw 'High Noon' a long time ago and loved it so I'd watch it again! Heaven Can Wait! Thank you! I love the movie The African Queen! I want to see Heaven Can Wait on August 2nd. I'd love to watch "An American in Paris"! Christina - xristya@rock.com - I'd like to see You Can't Take It With You because I've never seen it and have heard so many good things about it. I'd like to see Gaslight. July 21, 2009 at 9:38 PM This comment has been removed by the author. I would love to watch "An American in Paris"! I love Father of the Bride! Thank you for the opportunity to participate in this giveaway! I would like to watch Heaven Can Wait.